Job descriptions are the cornerstone of communication between you and your staff. After all, it’s hard for supervisors to measure job effectiveness during performance reviews unless they and the employees both know what you expect. Job descriptions can also be useful tools in court. For example, if an employee files an ADA lawsuit, courts will review what the organization has identified as the job’s “essential functions” to see if the charges have merit. Without a job description, the court may decide for itself which functions are essential. Recent case: For most of the year, city worker Roger Duello drove a dump truck. In the winter, he plowed snow. When he had a seizure, his driving privileges were suspended, including his license to drive dump trucks. Duello took FMLA leave and requested one of two accommodations: either more leave or a transfer to a job with no driving. Instead, the county fired him. It reasoned that Duello couldn’t perform any of the essential functions listed in his job description without a license and, therefore, wasn’t qualified for his position. Use specific and clear language. Instead of a general term like “good communication skills,” say the person needs “the ability to communicate company policies to nonmanagerial groups in person and in writing.” Instead of saying the position “requires heavy lifting,” say it requires the ability to lift 25 pounds repeatedly overhead 10 times per hour while stacking inventory. Begin with action verbs in the present tense, such as supervise, inspect, produce, organize, motivate, educate, administer, compose, analyze and repair. Identify essential functions that are critical to the job’s successful performance. Employees can file ADA lawsuits only if they can prove they’re legally disabled and can still perform the “essential functions” of the job. Key categories to consider: (1) physical skills (standing, walking, lifting, bending); (2) learned skills (equipment proficiency, industry experience); (3) job duties (hours, travel, shifts, location); and (4) behavioral skills (communication, leadership, time management). Update the description as often as needed. 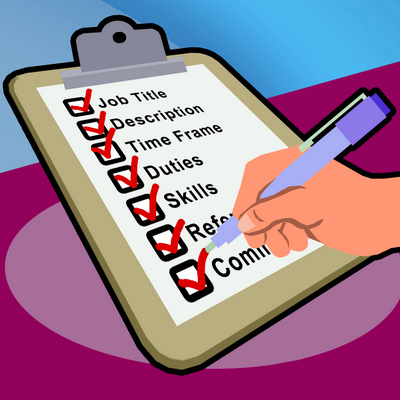 Review job descriptions periodically to ensure they accurately reflect the employee’s responsibility. Amend the document anytime an employee’s duties change, and review those amendments with the employee. 1. Does a job description exist for every position? 2. Do you regularly review job descriptions and update them to reflect changes in employee responsibilities? 3. Do you provide employees with written copies of their job descriptions? 4. Is the job title accurate? 5. Does the job title still reflect the position’s responsibilities? 6. Are job titles consistent throughout the organization? 7. Does the job description include appropriate qualifications for the position? 8. Does the job description accurately reflect the requirements of the job? 9. Are job functions and performance standards presented in clear, easily understood terms? 10. Are job descriptions free of references to age, race, gender, religion, disability or any other “protected” characteristic?